Not so hard. 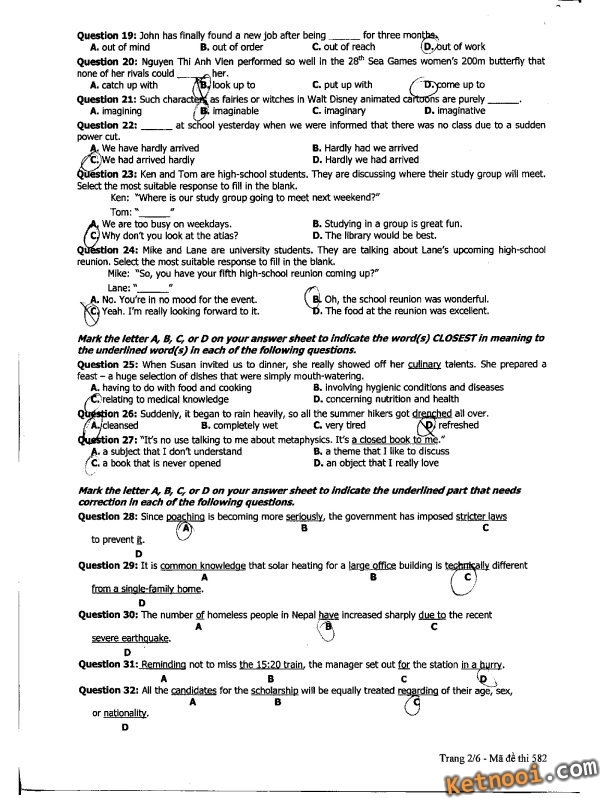 High School Graduation exam. 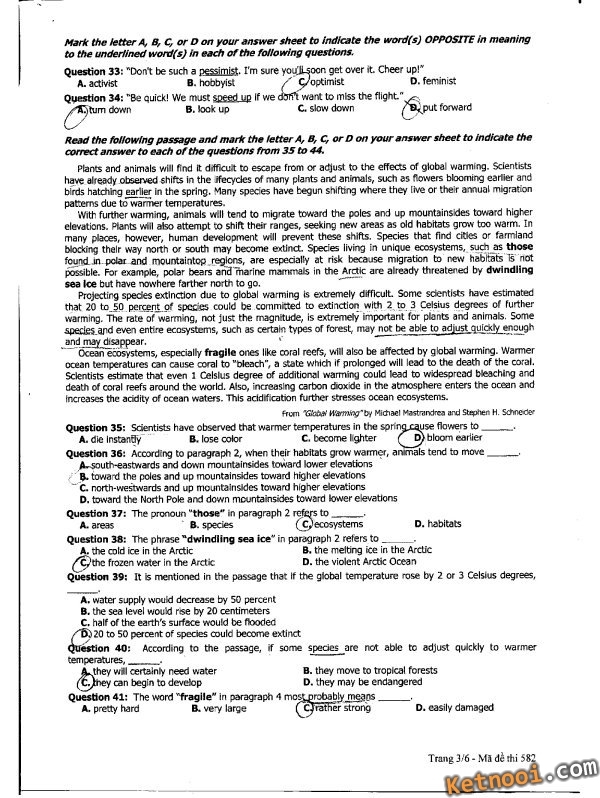 Question 39: It is mentioned in the passage th3t If the global temperature rose by 2 Of 3 Celsius degrees. 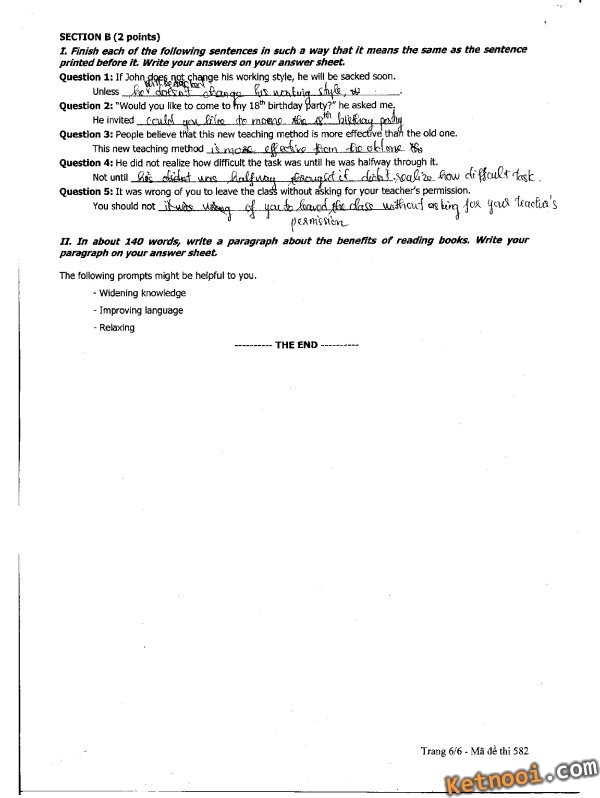 Question 41: The word 'fragile” in paragraph 4 mo^probabjy_mg3C>s. 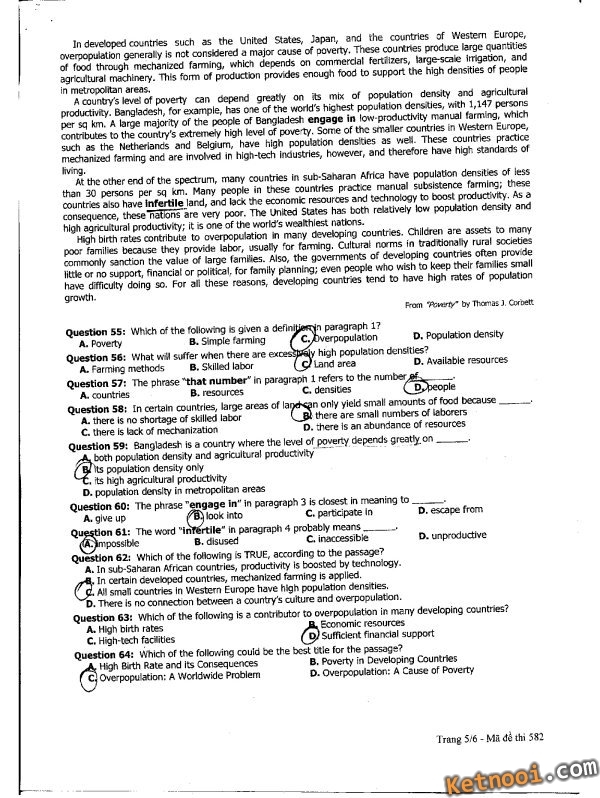 Question 42: The bleaching of coral reefs as mentioned in paragraph 4 indicates —. /A. 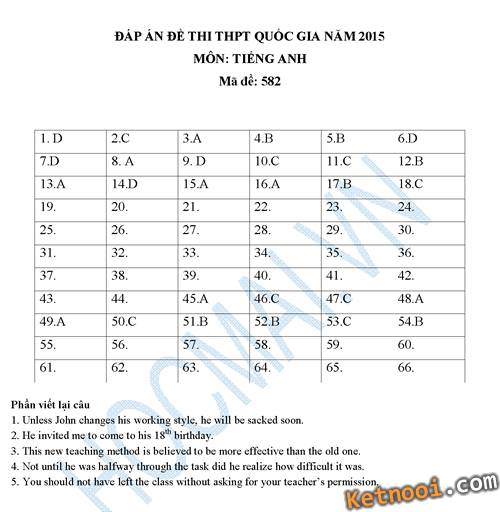 the decrease of acidity of the pole wafers St the loss cf acidity In the atmcsphere around the earth c. the rising amount of carbon Cioxide entering t*>e ocean Dể the extinction of species in coastal areas Question 44: What does the passage mainly discuss? 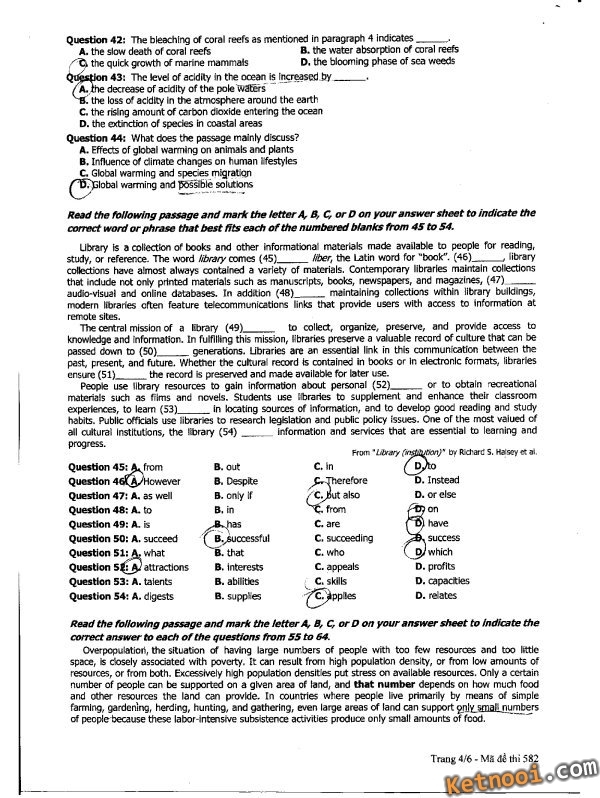 Read the following passage and mark the letter A, B, c or Don your answer sheet to indicate the correct word or phrase that best fits each of the numbered blanks from 45 to 54.
modern libraries cften feature tefecooimunicatiors links that provide users with access to information at rerrole sites. ensure (51).._the record is preserved and made available for later use. 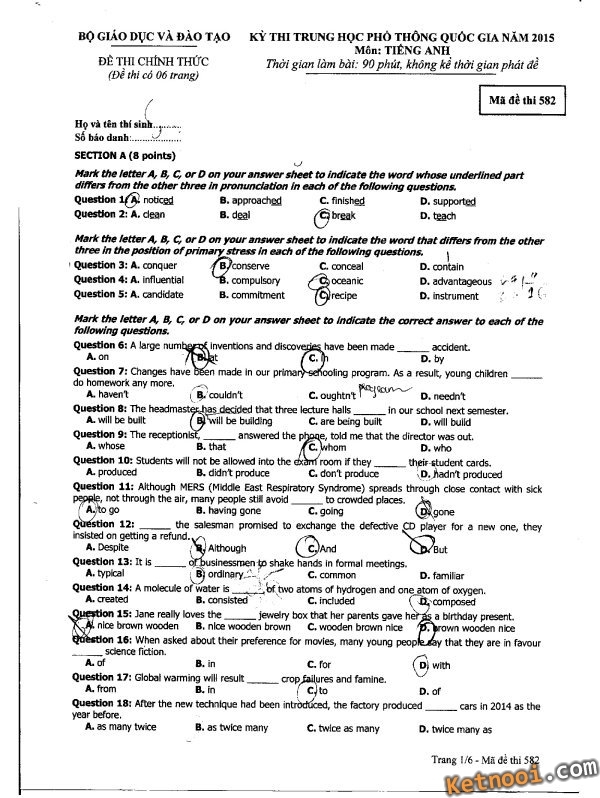 Read the following passage and mark the tetter A, B, c, or D on your answer sheet to Indicate tíìe correct answer to each of the questions from 55 to 64. Overpopulation, ữ>e situation of twving large nurrbers of people with too few resources and too little space, is ctosely associated with poverty, ft can result from high population density, or from low amounts of resources, or from both. Excessively high population densities put stress on available resources. Only a certain number of people can be supported on a glvan area of land, and that number deperds on how much food and other resources the land can provide. In countries wtiere people Iwe primarily by means of simple farming, gardening, herding, hunting, and gathering, even large areas of land can support pjiltsmaLnumbers of people because these labor-intensive subsistence activities produce only smalt amounts of icod. In developed countries such as the United States, Japan, aod the countries of Western Europe, overpopulation general.y is net considered d major cause of DOverty. These coumnes produce large quantities of food throựjh mechanized farming, which depends on comTtcrcJal fertitters, targe-scac irrigation, and agricultural machinery. This form of production provides enough food lo support the high densities of peoote in metropolitan areas. A country's level of poverty can depend grealty on its mix of population density and agricultural productivity. Bangladesh, for example, has oie of the world's highest population derives, with 1,147 persons per sq km. A large majority of ttie people of Bangladesh engage in low-productlvity rcanual farm ng, which contributes to the country's extrwety high level of poveiy. Scrre of the srraUcr countries in Western Ecropc, such as the Nt. 'tteflands and Belgium, have high population dens'ttes as weM. These countnes practice meơianũed farming and are involved in hIgMech industries, however, and therefore have high standards of living. At the other end of the spectrum, many countries in sub-Sarwran Africa have population densities of less than 30 persons per sq km. Many people in these countries practce manual subsistence farming; Wiese countries also have Infertile lard, and lacx the economic resources and technology to boosl productivity. As d consequence, these “nations are very poor. The United States has botti relatively lew population density and high agricultural productivity; it IS ooe of the world’s wealthiest nations. High birth rales contribute to overpopulation in many developing countries. Children are assets to many poor families because they provide labor, -jsuatty 'or farmíngồ Cultural norms in tradtíonaliy rural societies commonty safKtion the value of large tamrtes. Also, the governments of developing countries often provde little or r>0 support, financial or political, for family panning; even people who wish to keep their families small haw difficulty doing so. For an these reasons, developing countries tend to have high rates of population growth.